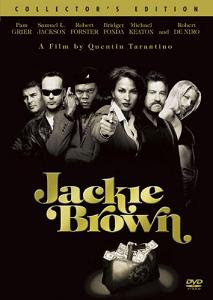 There are many of Quentin Tarantino's fans that think Jackie Brown is his poorest film. I would actually vote for Death Proof in such a competition but I can understand to a degree where their underappreciation of Jackie Brown comes from. First, it is the first Tarantino's full feature movie released after Pulp Fiction and since the latter is really great people's expectations for its successor should have been quite too high. Second, Jackie Brown is just not as "extreme" as other of Tarantino's films. Despite demonstrating many of his filmmaking trademarks, it is probably his most mainstream effort to date. But these two observations do not make the movie bad. It's fairly good and it's satisfying on many levels. Jackie Brown (Pam Grier) is a flight attendant using the airline she works for to smuggle the money of arms dealer Ordell Robbie (Samuel L. Jackson). When the FBI and the police, in the face of Ray Nicolette (Michael Keaton) and Mark Dargus (Michael Bowen), decide to catch the arms dealer they try to force Jackie to cooperate with them. She has a choice between jail and giving Robbie up but the latter could be more unpleasant than the jail cause Ordell Robbie does not leave people talking about him alive for too long. In this situation Jackie succeeds to enchant her bail bondsman Max Cherry (Robert Forster) and with his help she prepares a plan to get her out of the mess relieving herself of both the Feds and her boss. As Tarantino's film, Jackie Brown delivers many of the goods or techniques one would expect. There is enough talking, partially irrelevant to the plot, of course. There are memorable characters and as usual the most colorful ones are amongst the supporting cast. We should mention Robert De Niro in the role of somehow dysfunctional ex-con Louis Gara and Bridget Fonda who plays one of the many Ordell's girlfriends, Melanie Ralston. Unsurprisingly, Quentin Tarantino offers a non-linear narrative. There are plenty of deaths too. The ending is not a huge surprise but endings have never been excessively surprising in Tarantino's movies anyway. As crucial as the plot might be the most important thing about his films has always been the way he tells a story. Compared to the director's previous (and next) movies this one is probably his most conventional. Yes, it is not up to the standard of Pulp Fiction, which is a hard to match film, and this may be considered disappointing by certain people. The use of superfluous talking is not comparable to some of Tarantino's other movies and in this regard Jackie is closer to the broader audience although not being so Tarantino-ish is likely not to the taste of the director's core fan base. A piece of criticism could be mentioned against the screenplay too for not being very original. But the lack of timeless greatness aside, when you add the cool performances of Pam Grier, Samuel L. Jackson and Robert Forster to the almost expendable but funny supporting characters of Robert De Niro and Bridget Fonda plus the fine soundtrack you get an entertaining movie. Jackie Brown may not be as innovative as Quentin Tarantino's previous efforts but it is still an amusing thriller and if approached without prejudice it can ensure a few hours of good time.